Upgrade your space with the addition of an Ameriwood Home Julian Media Dresser. The clean lines and white finish on this unit allow it to fit with any decor. Place it in the bedroom for additional storage space. 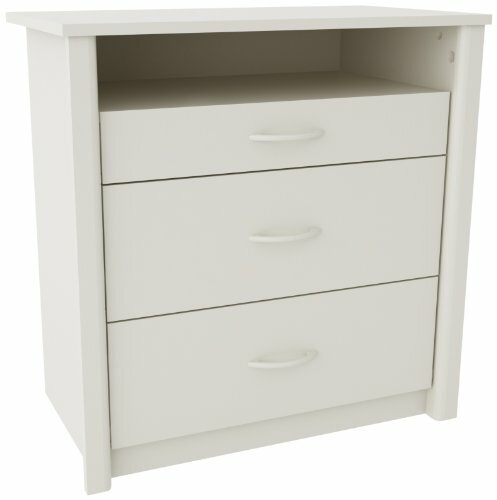 Featuring 3 drawers and 2 flat surfaces, this dresser can hold clothing, remotes, DVDs and games. Plus, this media dresser can hold up to 45 lbs. and accommodates up to a 32” flat-screen television. This American-made dresser is constructed from laminated MDF and particleboard, making it a strong, durable unit. Two people are required for proper assembly. While the drawers take time to put together, they are sure to last for years to come. The assembled dimensions of this media dresser measure 27.9375"h x 27.625"w x 15.6875"d.
Two people are required for assembly. Dimensions: 27.9375"h x 27.625"w x 15.6875"d. Shipping weight is approximately 120 lbs.